I worked and traveled extensively throughout the lower Mekong region and from 1995 through 2002 was based in Vientiane, Laos as a freelancer. 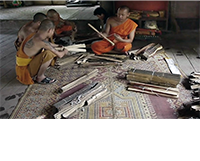 In partnership with archaeologist/art historian Catherine Raymond, I founded the Digital Conservation Facility Laos (DCFL), devoted both to environmental and cultural conservation; examining ways in which the loss of cultural assets parallels the loss of ecological assets, and developing products and methodologies towards braking that process. Multimedia projects include application of the “emerging visualization toolbox” to support ecological characterizations of the Nam Ngum and Xe Set river basins; the Interactive Taxonomic Atlas of Mekong Fishes; and the trilingual e-book version of the Lao Ramayana, illustrated by Thit Panh’s wonderful naïve frescoes at Vat Oup Mong (VOM), which were extensively archived before their demolition in 2000, and in 2010, faithfully replicated in the replacement main image hall at VOM, using a unique digital projection methodology devised by the DCFL. 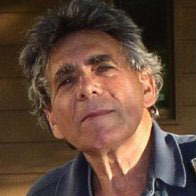 Alan Potkin —trained originally as limnologist specializing in tropical rivers— holds a doctorate in environmental planning (Ph. D., 1989) from U.C. Berkeley. His focus has always been on media applications in cultural and ecological conservation, and on the evolving interactive visualization toolbox for strengthening impact assessment, public participation, and post-facto evaluation. A combat veteran of the Second Indochina War —where from emerged a not-so-hidden agenda towards personally undoing some part of the damage— he was based in Vientiane from 1995 through 2002. While there he founded the Digital Conservation Facility, Laos (DCFL): affiliated since 2003 with both the Center for Southeast Asian Studies at Northern Illinois U. (NIU) and the NIU Center for Burma Studies. Dr. Potkin’s recent research has been on the aesthetics of waterfalls hydropower in Sri Lanka; on the 12,000 MW Myitsone cascade project on the Ayeyarwadi headwaters in Myanmar’s troubled Kachin State; on museums as essential to pharaonic projects; and on downstream learning —broadly defined— from Mekong Basin actual outcomes. 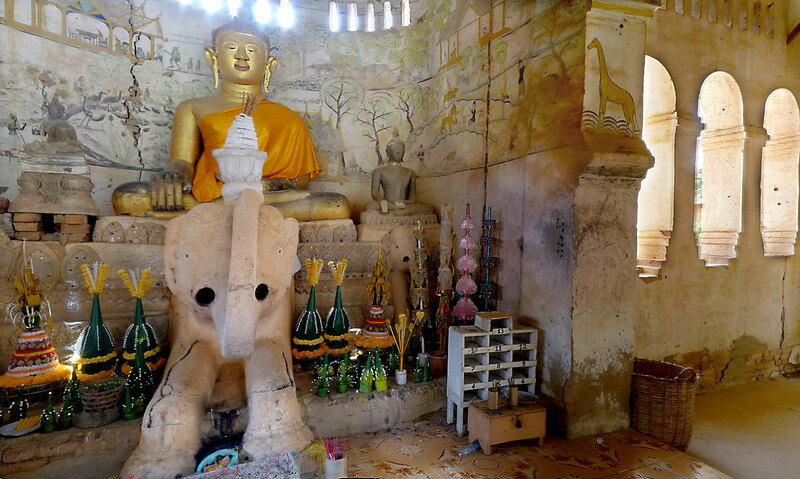 An Interactive Visualization Archive of Vat Taleo Kao: a semi-abandoned, “destroyed” Buddhist temple, in Savannakhet Province, Lao PDR. Visualization in Waterfalls Hydropower Aesthetics: Impact Assessment, Mitigation, and Post-facto Evaluation. An interactive archive of the urbanization of the Lao P.D.R.’s capital: 1898 (population ~5,000) through 2012 (population ~650,000). Arguably —in weighing the trivial power produced against the phenomenal downside— the worst hydroelectric dam ever built, anywhere. TVA on the Mekong: the semi-abandoned American visionary roots of Mekong Basin hydropower development. 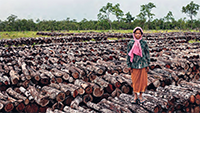 “Reclaiming” Boeung Kak for high-end development took evicting 2,000 former shoreline households and 4,000,000 cubic meters of pumped landfill. The 2004 earthquake damaged or destroyed many of the original reverse glass paintings, of which there was then no hi-rez archive. Burmese Reverse Glass Paintings at Wat Chong Klan, Lan Na (Thailand). The Phrakeo Morakot and the assassinations in Nong Khai of the pretenders to the Lao Lanexang throne: A hypothetical linkage. 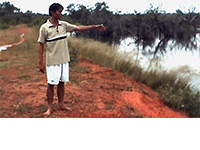 Before Nam Theun 2, outsiders were welcomed to harvest small catfishes (Mystus spp.) migrating up the Nam Pheet to enter the flooded forest. Some sixty million people inhabiting the Mekong basin have as their primary protein source fishes harvested from its waterways. Poster-manifesto for the regrettably cancelled Mekong Actual Outcomes Conference: a career-killer for international development insiders candidly critiquing failed projects? Before the Don Sahong hydroelectric project in Siphandone (Lao PDR), Khone Falls, “the Niagara of Asia” —unlike Niagara itself— had never been industrialized. For Asala Puja, many Ubon temples provide workshops for devotées to construct elaborate mobile juggernauts in Buddhist and Brahmanic styles. IUCN’s 1995 survey of Nong Chanh marsh in Vientiane showed its annual productivity —fish, wildlife, plants and “ecological services”— worth USD $1 million. Following an armed uprising in Myanmar’s Shan State, the Project has not yet been implemented: even performing the EIA is now impossible. Facilitating Sino-Myanmar hydroelectric development cooperation. Blaming up-basin freshwater diversions, in 2016, UNESCO presented an extremely critical report on the worsening mismanagement of the world’s largest estuarine mangrove forest. There presently exist neither basinwide agreements nor bilateral treaties regarding project impacts —including water diversions— between the Salween/Thanlwin’s co-riparians: China, Burma/Myanmar, and Thailand. Originally impounded twenty centuries ago —although mostly in ruins since the early modern era— its rehabilitation would irrigate ~25,000 hectares of under-producing rainfed paddy. At least 1,500 years ago, people of whose origins and fate we know almost nothing, erected hundreds of standing stone monuments atop wilderness ridgelines. Following wars between the Kingdoms of Siam and Lao Lanxang during the 18th-19th centuries CE, particularly-venerated Buddha images are in temples now in Bangkok and Isaan. Ten and eleven year olds from Ecole Hoffet and the Vientiane International School spent one week together documenting their experiences of Luang Prabang’s geography, architecture, history and mythology. there, the World Bank loaned $25M to the Lao PDR to rehabilitate 23 lapsed irrigation schemes; bringing forth unorthodox “Safeguard” technologies for overcoming problems, visualizing sites, and documenting success or failure. a contribution to the Pacific Neighborhood Consortium’s 2018 conference, themed “human rights in cyberspace”; presenting here contrarian perspectives on the globalized conventional wisdom and its enemies. Thanlwin/Salween dams driving a Shan armed uprising long predating the energy-starved Union of Myanmar’s forced embrace. Reversing visual and textual memory loss and cultural collateral damage; identifying and digitizing 1,250 double-sided palmleafbailane(comprising 97% of the original manuscript pages).